Another lovely vintage pillowcase from the linen cupboard. The bolster case is from the mid century, 1950’s era. 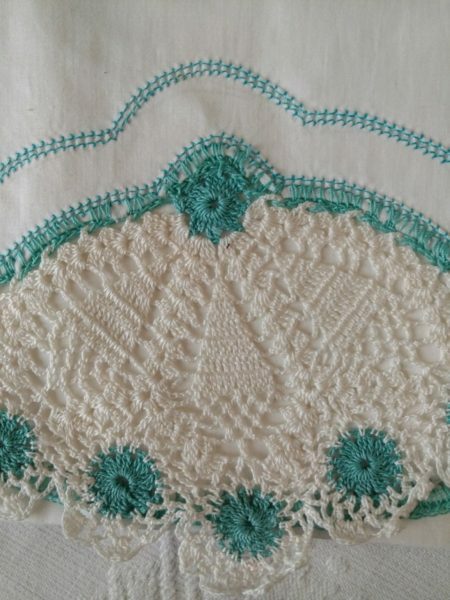 Made of white tubing cotton, with gorgeous Irish crochet trimming, in an aqua and white color thread. The long case is crocheted on both open ends in a scallop design. A row of hem stitching in the same aqua thread, follows the form of the scallop design. (front only). The back of case is scalloped, finished in a narrow edging.